For those brides who want their wedding to rival the wedding of Kate Middleton to Prince William here are a few royal wedding accessories that might inspire you. 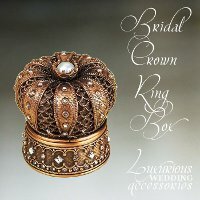 A Bridal Crown Ring Box is an elegant way for both the bride and groom to present their wedding rings to each other during the ceremony. Using two Crown Ring Boxes will make an amazing photograph as both the bride and the groom are presented the ring they will place on the hand of their beloved. Made in the USA from Museum Gold Plate and encrusted with pearls and crystals. 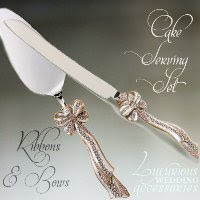 The Ribbons & Bows Cake Cutting Set by Luxurious Wedding Accessories is fit for any princess bride. The handle is made from Museum Gold Plate with a Stainless Steel Server. It is 13 inches in length. 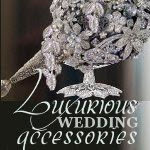 The handle has a background of Ivory Pearl and is encrusted with Swarovski Crystals. 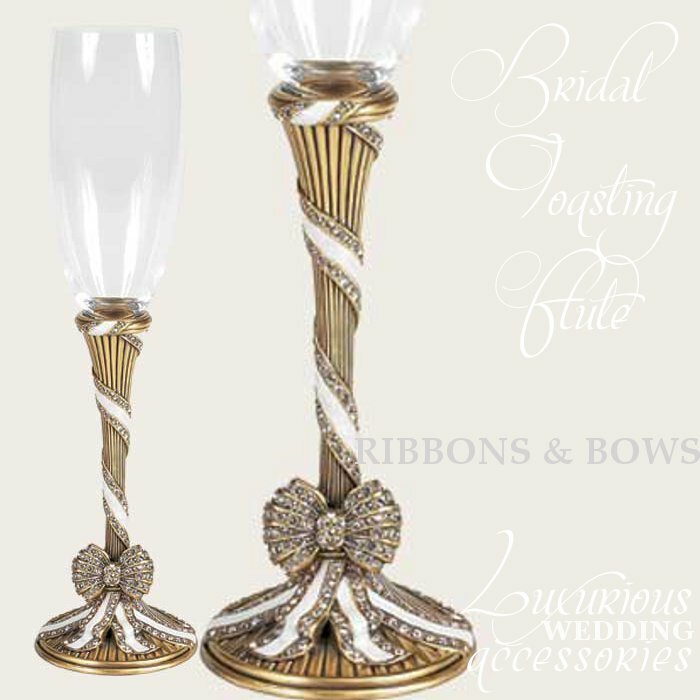 The matching Ribbons & Bows Toasting Flutes make a lifelong companion for your entertaining. 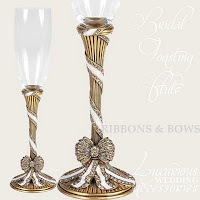 The base stem remains as a permanent reminder of your wedding toast and you can simply screw out the glass champagne bowls and replace them with a white or red wine bowl. Very clever. 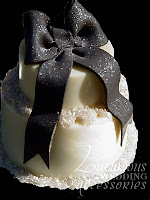 Complete the theme with a Ribbons & Bows Wedding Favor from the Luxurious Wedding Accessories Chocolate Candy Cake Collection. These Luxurious Wedding Favors are available in gourmet dark, milk, or white chocolate with hand-piped trim and individually-crafted flowers and other adornments of your choice. They can be designed and made to match your color or theme. Our chocolate artisan will be happy to work with you to create your vision. There is nothing more regal than our exquisite Luxurious Wedding Bouquets. These hand made silk bouquets are embellished with broaches that rival the crown jewels. Hand cut and molded silk flowers burst with life in various sizes. 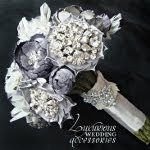 Each luxurious bouquet is custom made to compliment your gown. The gorgeous silk fabric flowers can be made in any hue. Each flower is embellished with rhinestones, crystals or genuine freshwater pearls. And no royal wedding could be complete without Luxurious Wedding Cocktails. 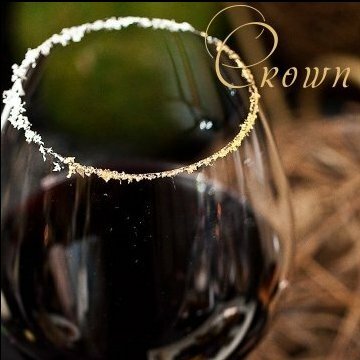 Crown is our garnish for your red wine glasses. Edible Sterling Silver and Edible 24K Gold crown the rim of the wine glass to enhance your table decor. Every Prince and Princess, Duke and Duchess on your guest list will lift their wine glasses in a toast fit for the King and Queen of the day.